Today, seven years after it qualified for the Oscars, I posted my little 4-minute movie on Facebook because not a lot has changed for those who find themselves homeless. It’s really heartening to find that, in just a few hours, it’s had over 2,000 views and that people are sharing it. It suggests that people do care and recognise that homeless people aren’t just a problematic statistic or a ‘category’. They’re individual people with their individual needs, problems, hopes and dreams. I really hope that this little film will help people to keep that in mind so thanks to all who took the time to watch it and share it. Today, in Dublin, there was a rally calling on the authorities to take meaningful action to ensure that nobody is left homeless. In a first world country like Ireland at Christmas with temperatures as low as -8 C there’s something broken in society when people are sleeping on the streets. In 18 hours 2,000 people had watched the four-minute film. A friend of mine was telling me about a blind date he was on recently. He was sitting across from the girl, trying his best to make her laugh with his funniest anecdote. It was proving to be an uphill battle, though, because she kept glancing down at the smartphone that she was holding in one hand to balance the wine glass in the other. So he was relieved when, as he reached the punchline, she burst out laughing. His relief was short-lived, though. She turned the screen of her smartphone towards him. While he’d been doing his best to amuse her, she’d been watching a funny clip on YouTube. I haven’t had that exact situation, personally, but I’ve certainly been in situations where I felt that I was in competition with a smartphone and that I was losing the battle. I have to admit, too, that I’ve sometimes been the culprit. I could be having coffee with a friend and my smartphone beeps. Even if I resist the urge to look and see what the notification is, part of my mind is distracted by wondering who or what the beep was about. I’ve been mulling it over and I’ve come to the conclusion that the problem lies in the lack of rules around smartphone etiquette. As children most people are taught about good manners – holding the door open for someone who arrives there at the same time as you or standing in line without jumping the queue. Even such things as the rules about how to eat politely without making a mess are passed on from parents to children, in most cases. The problem with smartphones is that they didn’t exist when we were children so there was no etiquette to pass down. The technology is practically brand new and the social media phenomenon is even newer. It strikes me, therefore, that some rules that we can agree upon – about what is acceptable and what is simply rude – would be a very useful thing right now. So, I’m launching a campaign. #LOTI stands for Log Out, Tune In. What I’m suggesting is that we should be able to post “Going for coffee with a friend #LOTI” and then feel free to put our phone on flight mode because we’ve let the world know that, for the next little while, we’re not online because we’re taking some quality one-on-one. So, when I go up to spend time with my Mum, who gets quite irritated when someone is distracted by their technology, I’ll post “Visiting Mum #LOTI” and people will know not to get upset if I don’t post ‘happy birthday’ to them on Facebook. It’s not because I don’t care. It’s because I’m not online being told what to do and when to do it (God help me, I’ll have to start remembering birthdays again unaided by technology). This week saw a return to sailing that, a few weeks ago, I feared might never happen. I’d had 14 fractures in my arm and wrist from my accident at the start of August and they’d given me the impression that putting Humpty Dumpty back together would have presented less problems. I can’t describe the sense of elation I had, then, when I was able to set off in my little boat and do all the rope tugging, tiller gripping and hanging on that was required to take her around the island of Ireland’s Eye and safely home. I’d set up a small camera to record the momentous occasion and my thoughts and all began well. I was just saying how, when I’m on the water, I make it a rule to switch off the technology, however, when, the radio mic cut itself off – offended, no doubt by my gadget-laden hypocrisy. My point was, though, that sailing is more than a recreational pastime for me. In fact, I get the same boost from it that I get when I walk on the Camino de Santiago. When I’m on the boat I get to switch off the world and loose myself in my thoughts and nature. It’s a chance to recharge the batteries. As Dublin’s much loved singer songwriter Damien Dempsey puts it; “Howth was the place I buried my troubles at sea”. Lately I’ve had so many friends confide in me that they’re feeling a sense of anxiety all the time. In most cases they’re not even sure what it is that they’re anxious about. I suspect that it could be something to do with being so hyper-connected all the time. Social media and carrying the internet in your pocket has massive advantages. When I was a good bit younger and traveling to see the world there were so many people that I met who I would love to have stayed in touch with but, although I carried their phone numbers around in an address book for years, it would have seemed a bit strange to randomly pick up the phone and say “Hey, it’s that Irish guy you met in Mumbai.” Now, though, half my Facebook friends are people I met in those kinds of circumstances and, even if we don’t talk frequently, I have a good idea what they’re up to in life and if I find myself in their part of the world or they find themselves in mine we touch base. The downside, though, is that lack of separation between social life and work. I’ve never worked nine-to-five hours but there was a time, quite recently, when you knew that after 5pm you weren’t going to be contacted by anyone who did have that kind of office job. The first time I sent a document to a civil servant on a Sunday night and got an immediate response totally shocked me. It’s now quite normal. People don’t seem to switch off. I don’t know if you have something that you do to step off the rollercoaster for a while but I hope so. If it’s particularly good please do share it with us in the comments. Out on the boat is my little “zen zone” for an hour or so while I potter around Ireland’s Eye and watch the seabirds. When I need a real break I spend a week walking to Santiago along the Camino, just switching on the phone once each day to make sure everyone’s okay before switching it off again and getting back to chatting to the people that I bump into who are usually also there to escape the digital ratrace for a while. There are two things that stand out for me about this week. One is, I suppose, a milestone and the other… well, it’s just hilarious. Anyone who has seen earlier posts will know that my Mum has Alzheimers and that we take turns in looking after her in her own home. My day on duty was always Sunday but now I have her Friday evenings too. The problem is that she still associates my presence with Sunday and she associates Sunday with a particular green suit. Unlike my sisters, being a male my Mum insists that I’m out of the room when she gets ready. That has led to a difficulty. No matter what I lay out on the bed for her each Saturday morning, she ends up in her green ‘Sunday’ suit because of her ‘Declan/Sunday’ association. This was the week that I finally came up with an ingenious solution. With the necessary approval from my fashion-conscious Mum, I got a nice blue print skirt, blue blouse and blue cardigan ready. Then, instead of laying them out on the bed, I took the clothes out of the room with me. I’d prepared warm, soapy water and a towel in the ensuite and I got her to throw out the night clothes she’d taken off to be washed so that I could be sure she was in her birthday suit. Moments later I could hear her splashing about quite happily. Then I heard her call out. So far so good. I was delighted. I opened the door a crack and handed in her underwear. Then I waited a minute or two. I repeated the procedure with the blue blouse. I handed it in through the gap. She had no difficulty with that. I passed it around the door. A few moments passed. I opened the door and my mouth dropped. There she was in her green suit. Of the blue clothes there was no sign. My gorgeous and charismatic Aunt Theresa was laid to rest in the past few days. Two of my sisters travelled to England to represent the family while we held the fort looking after Mum. It’s been such a poignant time. Mam’s the last one left of her siblings now, yet, because of her Alzheimers she’s lost in her own particular world where she’s no longer sure of who’s alive and who’s gone. Her earliest memories are of standing in a World War II air raid shelter and watching a woman push her baby into the waiting arms of an air raid warden as a piece of shapnel decapitated her before just as she reached the door. And, shortly after that, sitting on a train with her mum who told her to wait because she was just slipping out to the toilet. As the train started to pull out she started screaming for someone to stop it because they were forgetting her mum. A nun in the carriage slapped her legs and told her to be quiet. That was the last time she saw her mother for several years. She’d been evacuated to the countryside where she has horrible memories of abuse by the people who were obviously getting some sort of allowance to take her in because they certainly weren’t doing it for love! Her life wasn’t easy. Dad adored her but he was self employed and worked long hours while she was left at home with an ever growing number of kids and, because they’d moved her from England, no real friends or family support. We grew up to the sound of mum complaining constantly to Dad who never argued back but would disappear climbing mountains. That frustrated her even more than any arguing he might have done. It was only when dad was forced to retire through illness that we watched them fall in love all over again. They were like a teenage couple. Inseparable. That’s what made it even more heartbreaking to see her lose him. They’d been together for over 50 years but had only really found each other in those last ones. So now she’s alone at the head of the family in age but as dependent on our love as if she was a child. And I guess we’re trying to give her the childhood now, that she never had then. So we won’t tell her that her sister has gone on. We’ll shout at the TV when ireland play, watch Nanny McPhee or The Quiet Man for the umpteenth time and listen to the same memories of her youth that seem a lot clearer to he than what happened an hour ago. And, every now and then, amid the repeated anecdotes that we no longer can verify as accurate, she says something profound or insightful. And we know that we’ve not lost her yet. 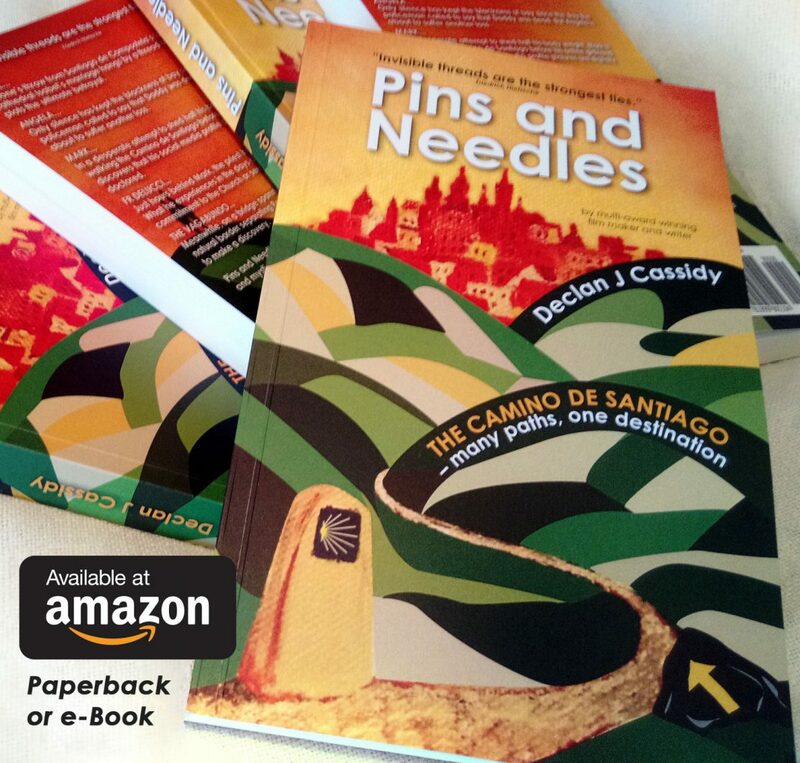 It’s a week after the official book launch of ‘Pins and Needles’. I’ve been flat out with work since so haven’t really had time to reflect or follow up properly but I thought I’d post something before it became a distant memory… The evening couldn’t have gone better. There were 70 or 80 people in attendance and about 50 books sold – pushing the novel into the Hodges Figgis best seller category. The book is now in the window display, under New Irish Authors and a couple of other locations around that gorgeous store (including the Travel Section, due to the Camino de Santiago influence, no doubt). Apart from the practical success of the launch and book sales, it’s been a fabulous realisation, for me, that I have people out there who are interested and who care enough to give of their valuable time (and money in many cases) to come along. My sister Gillian with her husband Stephen and family had a car break down on the way but it didn’t stop them from getting the rest of the way on foot. Melanie Murphy, the YouTuber and author, had said she’d pop along when I was at her recent book launch. True to her word she took time out from her own book circuit to be there. Natasha Rocca Devine from The Interiors NRD arrived – quite likely from LA or somewhere – and did very slick and professional promotion for me. One of the most touching occurrences was the arrival of practically my entire Trinity Italian class and no less than five Trinity professors. There’s something special about seeing your book with those of authors you know and respect.